CLI continually examines ways to help clients become more effective marketers, and that often means that we look at the same things as others in very different ways. As you remember, Freud thought that most people reacted in the same ways to the same stimuli. Research since that initial hypothesis discovered the error in that thinking. We now know that most people do not respond in the same ways to the same things, so marketers must discover what motivates Customer A to buy, then what motivates Customer B to buy, and so on. For example, while most marketers look at copywriting as describing their products (or the values and benefits of their products), and they view their emails as ways to convince customers to buy stuff, CLI sees the words of product descriptions and emails as the tools that affect the brain while knowing that we drive sales by choosing words that convince customers of the benefits to them and that generate good feelings in the brain. Little that we do stands alone. The words that we choose interact with serotonin, dopamine, and oxytocin in the brain. 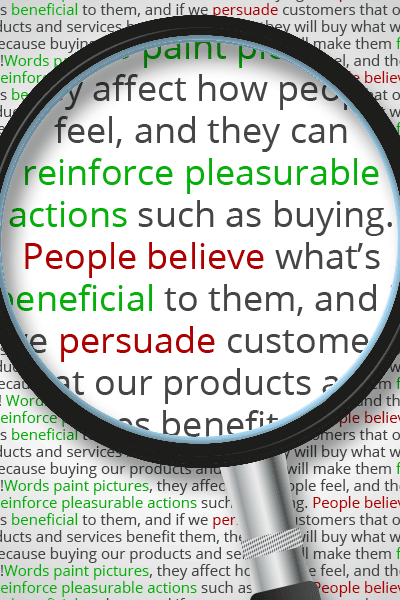 Words paint pictures, they affect how people feel, and they can reinforce pleasurable actions such as buying. People believe what’s beneficial to them, and if we persuade customers that our products and services benefit them, then they will buy what we sell, because buying our products and services will make them feel good! Enter PERSONIFY. PERSONIFY helps you understand each of your customers and drive sales through that understanding, and CLI works with you to help you choose the right words that change the attitudes and actions of your customers. How does CLI do this? With a staff of people trained in psychology, rhetoric, and business, CLI applies both the science and the art of how words affect the brain and drive sales. Applying state-of-the-art analytics in concert with our psychologists, rhetoricians, and MBAs, we know what motivates your customers, and through that analysis, we can help you predict what your customers will do when presented with the right words. That prediction ability allows you to tap into the area of the brain that finds pleasure in buying your products and services, and once that pleasure cycle starts, we can help you understand how to keep it going. You can find yourself among the select group using PERSONIFY to market individually and discovering how the right words can drive sales, build your brand, and keep customers loyal.